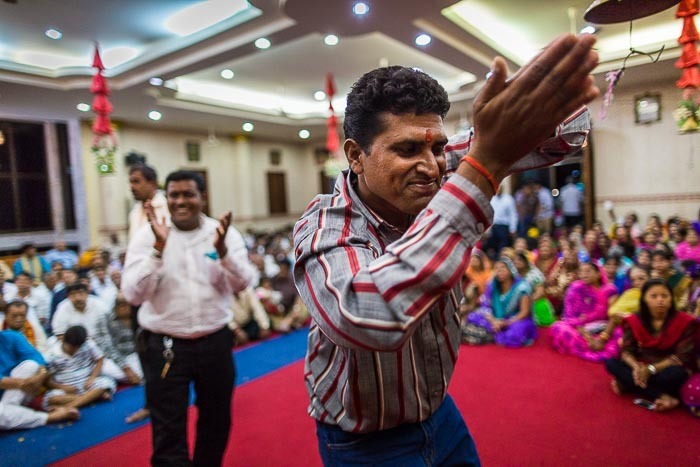 Men at the Vishnu Temple in Bangkok during the Janmashtami celebrations at the temple. I went to the Vishnu Temple in Bangkok last night to photograph the temple's celebration of Janmashtami, the birth of the Krishna, the eighth avatar (incarnation) of the Lord Vishnu. It's an important Hindu holiday and a joyous one. The services was supposed to start around 7.30PM. I got there about 7 so I could talk to people and make sure it was okay to photograph. The 7.30 start time was more a suggestion than an actual start time though and the service didn't really got rolling until around 9. 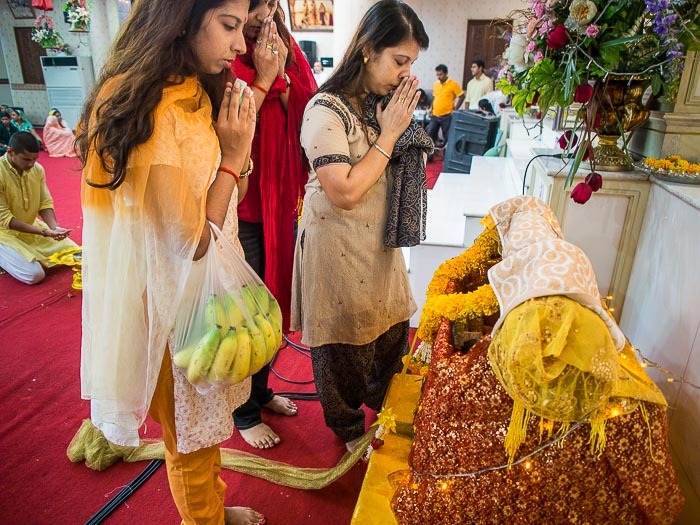 Early in the service, women pray at a crib that represents Krishna's crib. By 10.15PM the temple was packed and the service was really going. There was a band at the front of the room backing up vocalists who led the crowd in prayer through song and call and response. 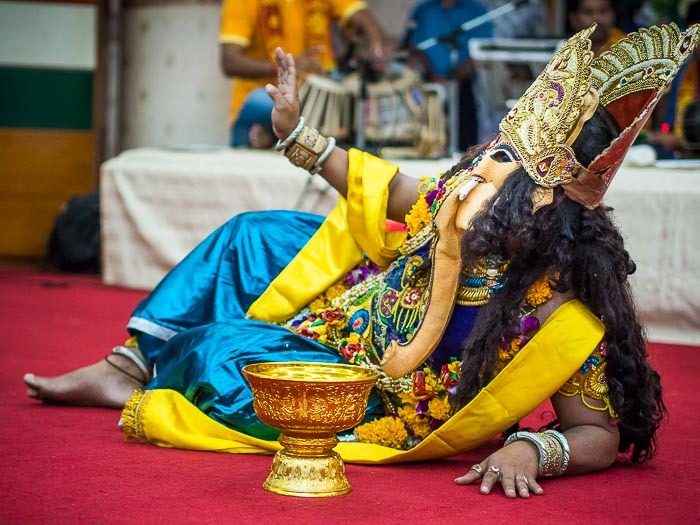 Hinduism is nothing like Christianity - the two come from completely different traditions and parts of the world - but the service reminded me a lot of revival meetings and evangelical services I've covered in the US. Men pray during the service. As the night went on, the temple became more and more crowded. By the end of the night, it was full well past overflowing. There was no room left inside, people in Hindu temples sit on the floor, and the floor was completely full. There was a narrow aisle from the doors to the front of the temple, but even that was impassible as people overflowed onto the aisle. I was struck by genuine warmth and kindness people showed me through the evening. I was the only farang (Thai for European or white skinned foreigner) at the service, between that and my cameras I really stuck out.Throughout the evening I was treated as an honored guest. Even though people sit on the floor during the service, I was repeatedly offered a chair, which I declined because I was moving around the room as I photographed, and not one person looked askance at my photography. It was a great evening. There are more photos from Janmashtami in my archive.